Derby and I are still awaiting a saddle fitting, which has left us temporarily grounded. My friend Cathy generously said I could ride her lovely mare Atlanta in my lesson on Thursday, however, a couple days of business travel and a wild thunderstorm the night before had wiped me out. I groomed and tacked Atlanta, and handed the reins to Christy, for a previously scheduled training ride. I used to watch Christy ride all the time, before she turned pro. These days, my opportunities to see her ride are much less frequent, and I when I do see her ride, it’s usually on one of her own horses. Watching her ride Atlanta was a rare treat, because it’s fun (but also very humbling) to see the effect correct riding has on a horse – especially one as fancy as Atlanta. Needless to say, the mare sure looked different than when I’ve ridden her in the past. There’s a reason why I have a day job, I guess. Atlanta has had some time off recently, but is going beautifully now. 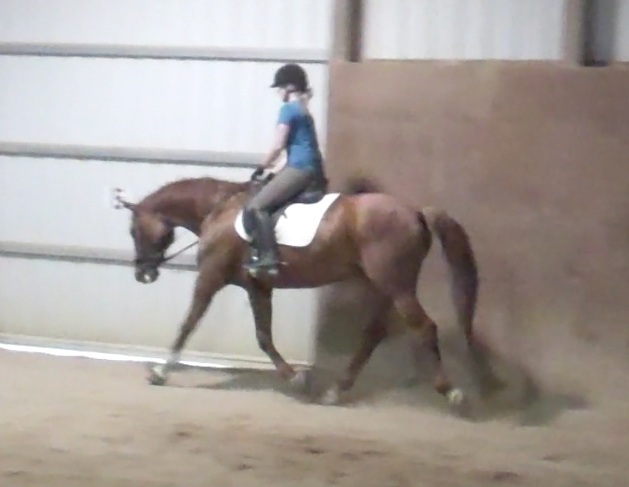 Christy focused her ride on stretching the mare, and working her over her back to help build her top line. This is exactly the type of work I will need to do with Derby, once we get going. Atlanta is uphill, working over her back, and stretching beautifully into the contact. Christy started her ride on Atlanta softly asking her to release her neck and become supple. She started with a little shoulder fore at the walk, and then upped the lateral work ante from there, moving the mare’s shoulders and haunches in and out, asking her to to step under herself and reach, reach, reach into the bit. They moved into trot, and Christy continued to insist that Atlanta reach into contact and stretch. It was a textbook display of riding back-to-front, and the mare really responded, covering a ton of ground, working in a lower, stretchy frame. As cool as that was to watch, watching the canter work was even cooler. The mare’s back was up, and her canter was balanced and something to behold. 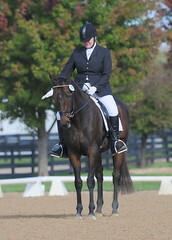 I have always enjoyed watching Christy ride my horse, even though it is (as I mentioned earlier) it’s humbling. I’ve ridden Atlanta a couple times, and it was all I could do to invite a little stretch at the walk. 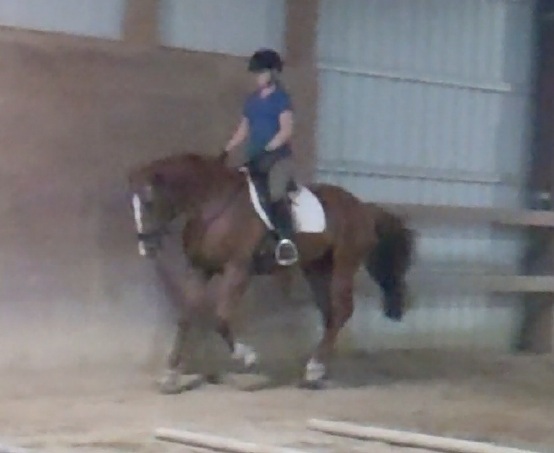 Riding bigger gaits back to front is, at the moment, something I struggle with. I watched and learned, wide awake, and inspired. A beautiful, uphill canter, again with nice contact.